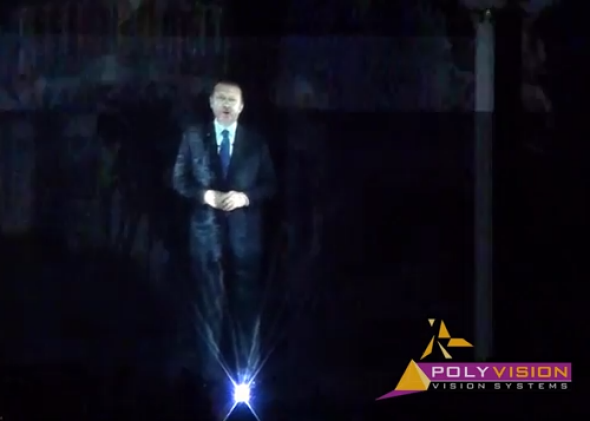 Turkish prime minister proves that a 10-foot hologram is the best way to deliver a speech. Turkish Prime Minister Recep Tayyip Erdoğan casually gives a speech to his party as a pre-recorded hologram. With the State of the Union set to air in a few hours, people have been talking about things Obama could do to make the annual address less boring. Well … here’s an idea. The Turkish prime minister apparently views speech-by-hologram as a legitimate communication option, because he delivered a pre-recorded speech to his party as a 10-foot hologram on Sunday. So maybe Obama should, too! Recep Tayyip Erdoğan gave his speech in front of a green screen because he couldn’t make it to his party’s meeting in Izmir, a city in western Turkey. At the event, his visage, and entire body, appeared out of swirling blue light at the front of the meeting as the room went dark. And naturally, the crowd went wild. Erdoğan talked about municipal elections and a high-profile corruption scandal that has been plaguing the Turkish government. It was a more serious use of a hologram than resurrecting Tupac, but the talking points certainly didn’t detract from the novelty. And as the Verge points out, holograms have been used in politics before, like when an Indian politician broadcast 26 holograms of himself around Gujarat in 2012 to make a statement about India’s tech prowess. And, of course, CNN dipped a toe in the hologram waters during its 2008 election night coverage, much to viewers’ confusion. But on the whole, successful hologram implementation has been elusive. The setup has to be accurate, and nothing can disturb the beams of light forming the image. The concept is captivating, though, and offers a viewing experience that can’t be achieved in the same way through other current technologies. All it would take to get the whole world buzzing about improving this technology would be hol-Obama delivering the State of the Union tonight.